The Lightning Guider Sleds historical marker sits right in front of the Old Sled Works Antique and Craft Market in Duncannon, Pennsylvania. The building sits on Market Street at the south end of town. If you're looking to document this historical marker, you can pull into the parking lot beside the Old Sled Works and walk across the street to the old building and marker. I spent most of my childhood living in Duncannon and I remember this old factory very well. When we were kids...we all got our snow sleds from Lightning Guider and they were the best at that particular time. They had metal runners and wooden seats and they would glide nicely down snow-topped hills or across frozen ponds when pulled. I'm sure many of you remember them from your childhood too! Produced between 1904 and 1988 by the Standard Novelty Works, located here. 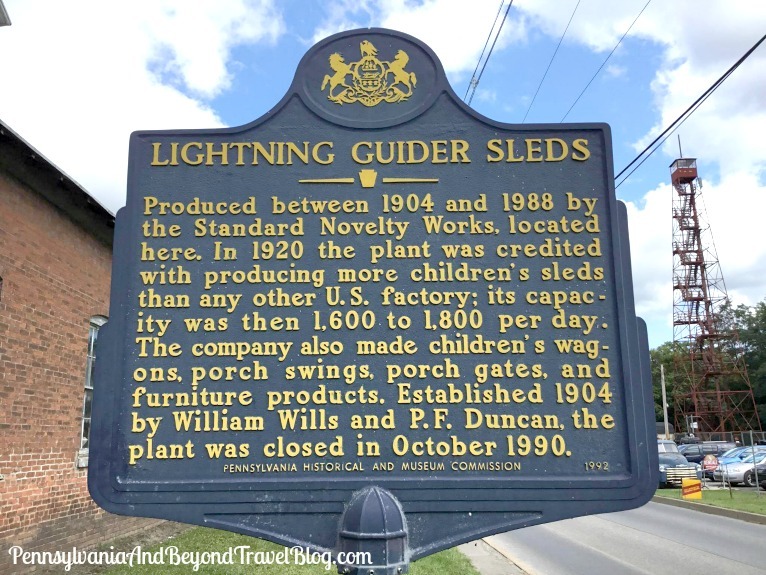 In 1920 the plant was credited with producing more children's sleds than any other U.S. factory; its capacity was then 1,600 to 1,800 per day. The company also made children's wagons, porch swings, porch gates, and furniture products. Established 1904 by William Wills and P.F. Duncan, the plant was closed in October 1990. By: 1992 by Pennsylvania Historical and Museum Commission. In my photograph above you'll see the Duncannon Forest Fire Lookout Tower sitting in the distance (to the right). You can learn more about the Duncannon Forest Fire Lookout Tower by visiting a previous feature that we wrote on that. They've turned it into a tourist attraction and for a small fee, you can climb to the top and get some beautiful views of the Susquehanna River and the surrounding area. I like that this plant was once the largest producer of children's sleds. It would be very interesting to see this site.